A wide, rectangular porcelain sink providing abundant space in the bathroom. ADA-compliant, the offset drain allows for more upfront room below the cabinet, making it comfortable to use by anyone with or without a disability. Its overflow hole prevents excessive filling. 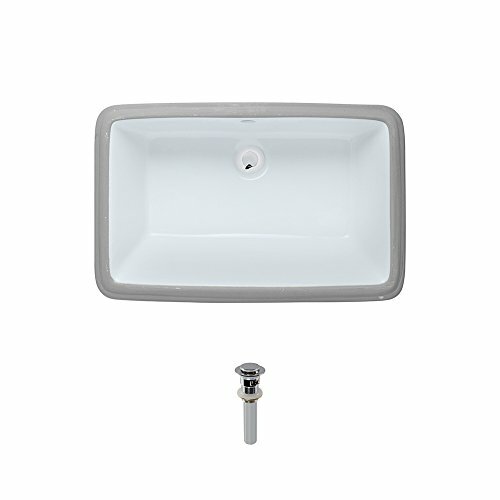 The additional vitreous china coating on this model creates an even more impervious and sanitary surface than standard porcelain. With an overall measurement of 21-1/2 in. x 14-1/8 in. x 6-3/4 in., it will require a minimum-width cabinet of 24 in. Additionally, a spring-loaded, pop-up drain (pud) is included, which opens and closes with a simple press to its attractive chrome cap.